Shiraz villa comes highly recommended and has a real ''Wow'' factor. 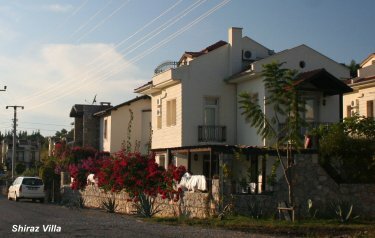 Villa offers comfortable family accommodation over three floors each have a balcony, Benefit from full air-conditioning. A 4 Bedroom Villa With Private Pool and Garden. Fully Air-conditioned throughout. Out door Stone BBQ and sink.Three seating areas includes a Large Granite Stone table in the terrace area and a large white marble table by the BBQ area for your ultimate comfort, Cool off in Outdoor Shower and large size swimming pool. Koshk is a large seating area located under the Shiraz Villa's large palm tree suitable for 7+ people. Bedroom 1, Master double bed, wardrobes, cupboards & dressing table, en-suite bathroom and shower, WC, hand basin, Patio doors to large pool view balcony with seating. Bedroom 2, Top floor, double bed with wardrobe & cupboards with patio doors to very private balcony/terrace,sun lounger with veiws of BABA DUGG Mountain . Large en-suite bathroom with wet room double shower, WC & hand basin. Bedroom 3, Two single beds with wardrobe, cupboards & drawers. small balcony facing pool side and BABA DUGG mountain,The family main bathroom is next door with large shower cubicle and hand basin & WC. Bedroom 4, Single bedroom; one bed with wardrobe, cupboards & drawers, small balcony facing rear garden. The family bathroom is located next door, with bath / shower, WC & handbasin. Airport transfer from Dalaman airport to & from Shiraz Villa will be arranged for you with English speaking representative of Shiraz Villa. 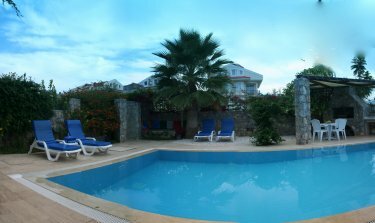 You will be greeted by our agent at Dalaman airport,taken to Shiraz Villa and at the end of your holiday you will be picked up from the villa at your chosen time and taken to Dalaman airport. Shopping trip could be arranged,you will be picked up from the villa and taken to the supermarket,once you have finished your shopping you will be taken back to the villa. the cost for this service is around 40 Turkish lira (�15) this is payable locally.